Platil Souverän. Discounts Apply ! The strongest line from Platil®, produced by the German manufacturer leading in quality, progress and development for over 50 years. You feel it immediately, the superior suppleness, the elasticity adapted to breaking strain, and the inexhaustible strength enabling your professional casting and trolling of lures are the factors which ensure best catches. It’s optimized surface coating provides persuasive fray and abrasion resistance. You’ve got an outstanding strength in the knotted line as well. 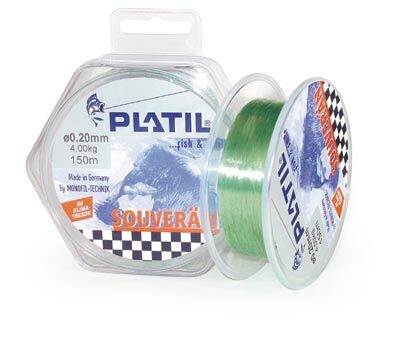 A smaller diameter of Platil® Souverän in comparison to other lines with similar rated pound tests allows for more natural bait presentation. Retains stregth and suppleness in extremely low temperatures! Made in Germany.